No need to dig up your garden. Suitable for most ground conditions. Completed in only a few hours. No heavy machinery, no mess. Contact our friendly, helpful staff for advice and a quotation. Book your installation date and sit back. Our qualified installers will do the rest. 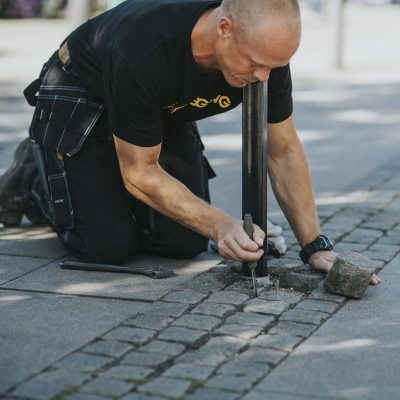 We have all the knowledge and equipment to install our ground screws in most ground conditions, even in patios, concrete and tarmac. Just show us where your decking is to go and let us install the ground screws in the right place with laser accuracy. Now you’ve saved days of back breaking work. You can build your deck easily and quickly in our stable, level ground screws. Video of our speedy installation. Building a deck or terrace with our ground screws is simple, easier and much faster alternative to using conventional concrete foundations. The joists are simply fastened to the ground screws which are installed around one metre into the ground. The timber is held clear of the ground, reducing rot, greatly increasing the lifespan of your decking. The method is well established all throughout Europe, and used by many contractors in the UK and Australia! After installing the ground screws, work on the deck can be started immediately. 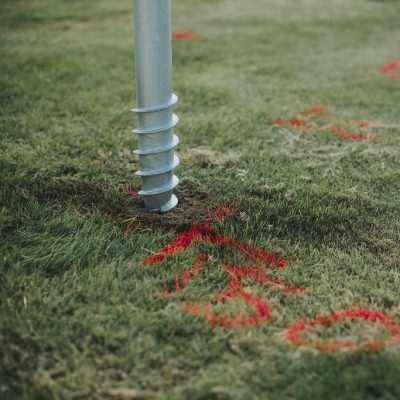 The main advantage of using our ground screws is there is no digging. So there´s no need for all that back-breaking spade work, mini excavators or skips. Our installation system is clean and leaves no damage to the garden. So there’s no need for back-filling or repairs. Apart from the perfectly positioned, level ground screws you wouldn’t even know we had been. It can take days to prepare concrete foundations, where our installations generally only take a few hours. As a consequence you save valuable time and money. Installing a ground screw is fast. We install the screws at the perfect position for your project and at just the right height. Before installing the ground screws we pre-drill to remove any obstructions and ensure stable foundations. Comparison: Ground Screws VS. Concrete Foundations. A general comparison showing approximate times. Request a quatiation to get your deck completed in record time. Contact your local installer for a quote. Just type your area in the box below and we will find them for you.